Some of my favorite things in life are skinny mirrors, the wine & cheese tasting table at Trader Joe’s, lifting heavy weights, singing in the car, and Chinese food. I’ve always loved going out to eat for Chinese food – whether it be the authentic straight-outta-Chinatown kind of Chinese food or the the Americanized, Tiki version. Maybe it’s the whole sitting at a big table with lots of family and friends and sharing a lot of good food that appeals to me – like a whole fish, or whole duck, or pu-pu platter. It could also be sharing a scorpion bowl or two that’s part of the appeal. General Gau’s or Tso’s is one of those dishes that’s part of the experience. I don’t care about the origin of the dish, whether or not there was an actual General, or what the correct spelling of his name was. This dish is damn good. 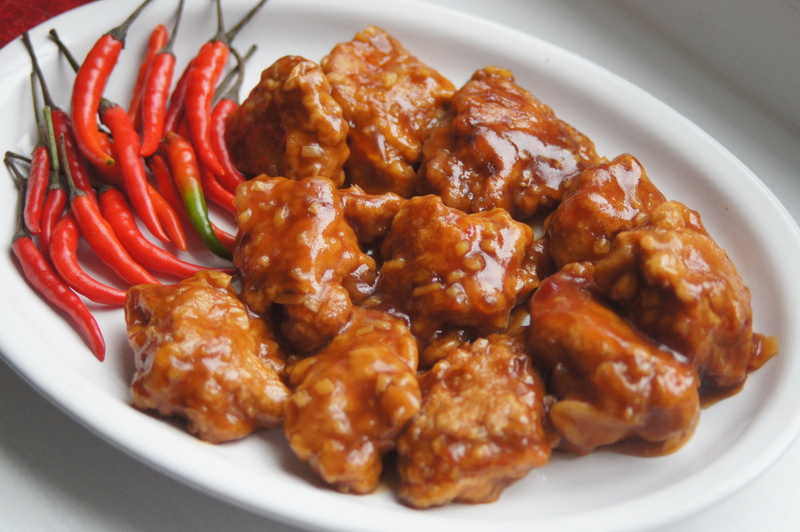 General Gau’s Chicken is one of the dishes my family and I order when we go out to eat and I always thought it was one of those things that’s better to eat at a restaurant because it’s impossible to make at home. And by impossible I mean, it seems like a lot of work and do I really want to make it? I came across this recipe from Food & Wine and after reading it through I thought, maybe it’s not so hard. So I tried it and followed the recipe exactly as it was written. (Well, except for adding the scallions since my husband and sons aren’t big fans. It really doesn’t make a difference either way.) Turns out it really wasn’t that hard to make. When I plated the Gau’s it looked really pretty and legit looked like we ordered from the menu. Then when we ate it…we had to do a double-take and look around and make sure we weren’t sitting in an actual Chinese restaurant. It was that good. Actually, it was better than what we order when we go out. So savory, so tender, and not goopy. There was only only thing wrong with it when I made it that first time: it wasn’t enough. The recipe calls for one pound of chicken thighs and that’s fine for a couple of people. Or one if you’re like me. So since then I’ve doubled, tripled, and quadrupled the recipe. I’m not going to lie: doubling, tripling, and especially quadrupling the recipe is time consuming. You will spend a while pan-frying the chicken. But don’t be discouraged it will be worth it in the end. I found it’s easier and less messy to use a Dutch oven for pan-frying. Also, to save some time, I’ve pan-fried the chicken ahead of time and when I was ready to serve it I would heat it up in the oven at 350°F for about 5-10 minutes while I make the sauce. It does help and doesn’t make you regret making so much and eventually being so tired of looking at the chicken that you don’t even want to eat it anymore. That’s the worst when you just want to break up with something you’re making because it’s taking so long and you’re just tired of looking at it. In a medium bowl, combine the toasted sesame oil with the 3 egg whites, 2 tablespoon of the soy sauce and 1/2 cup plus 4 tablespoons of the cornstarch. Add the chicken, stirring to coat. Let stand at room temperature for 20 minutes. Meanwhile, in a small bowl, whisk the chicken broth with the chile-garlic sauce, sugar and the remaining 1/2 cup of soy sauce and 2 tablespoon of cornstarch. In a large saucepan, heat the 1-1/2 tablespoons of oil. Add the ginger and garlic and cook over high heat until fragrant, about 1 minute. Stir the broth mixture, add it to the pan and cook until thickened and glossy, about 3 minutes. Keep the sauce warm over low heat. In a large, deep skillet or wok, heat 1/2 inch of oil until shimmering. Carefully add the chicken, one piece at a time, and fry over medium high heat, turning once or twice, until very browned and crisp, about 4 minutes. Drain the chicken on paper towels and immediately add to the sauce along with the scallions. Cook just until coated, about 30 seconds. Serve right away, with steamed broccoli and rice. This is my favorite when eating out. However, Helena, MT doesn’t really have any good Chinese restaurants and I have the chicken thighs in the freezer, just need the broth and ginger….guess what we will be trying for dinner soon! Thank you for stopping by The Tasty Page, Judy! I think you will really enjoy the General Gau’s and will enjoy making it. Have fun and please stop by again and let me know what you think of it! So proud of my cousin Joyce on her delicious recipes shared on the tasty page!! Happy & healthy eating everyone! P.S. Do we all remember Chau Chau restaurants in Chinatown Boston?!! Those were the best in the 90’s!!! Naive question alert: Can you buy the toasted sesame oil and Chinese chili-garlic sauce at a typical grocery store? Or Trader Joes/Whole Foods? Hi Jenn! Not a naive question at all! I’m happy to say that you can easily find the sesame oil and chili garlic sauce at the local grocery stores. I use the chili garlic sauce with the rooster on it (same brand as Sriracha) and I’ve found it at both Roche Bros. Supermarkets and Shaw’s. I use the sesame oil from Trader Joe’s, but you can find sesame oil at Roche and Shaw’s too. Hope that helps and happy cooking!